It is sometimes said that natural disasters don’t discriminate. Everyone, rich or poor, is vulnerable. While technically true, the reality is quite different, with the poor and working class disproportionately affected and saddled with the most difficult recoveries. This unfortunate fact of life was in evidence again in an Al Jazeera profile of recovery efforts in the town of Jojutla, Mexico, following the earthquake that struck last September 19th—an earthquake that hit exactly 32 years to the day after a similar earthquake devastated Mexico City. 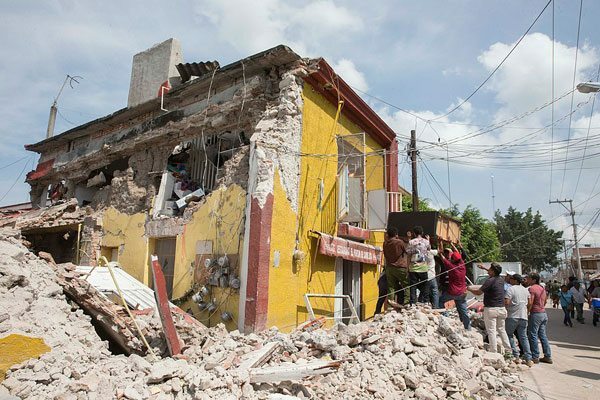 At least 30 people were killed in Jojutla, and more than 3,000 buildings were irreparably damaged. Amador pointed out one of the most devastating long-term effect of natural disasters—their unnatural effect on the economy of where they hit. NPQ has reported on the long-term economic fallout of natural disasters—the man-made disasters, so to speak—and how they disproportionately affect those who were already struggling financially. In Haiti, a 7.0 earthquake struck near the capital city of Port-au-Prince on January 12, 2010, killing an estimated 200,000 people. (Estimates actually ranged between tens of thousands killed to 300,000; the unknowns there are themselves a sign of Haiti’s poverty and lack of resources to carry out basic functions of government, like keeping a census.) In Chile, about six weeks later, an 8.8 earthquake struck, many times stronger than the Haitian earthquake. While it affected most of Chile’s population, the death toll, 525, was much lower. The difference can be measured in Haiti’s poverty. It is by far the poorest country in the Western Hemisphere and one of the poorest in the world. Many buildings, poorly constructed with inferior concrete or perched precariously on hillsides, simply collapsed and crushed their inhabitants. The long term effects of the Haitian earthquake can still be seen, especially as the country, as NPQ has reported, has become a poster child for how billions of dollars of aid can pour into a place and yet somehow not improve the situation—economic or otherwise—of most of the people who live there. In Jojutla, Amador told Al Jazeera that in her housing complex, where she is the neighborhood association president, only 12 of 157 homes were spared major damage, and 73 were beyond repair. Amador’s housing complex was built in the 1980s by a federal program that offered low-interest loans to workers. Most of the people there had paid off their loans and now owned their houses, but this is actually bad news after the earthquake. Many of the people who lost their homes in Amador’s housing complex are now living in tents that were donated by the Chinese government. Adding to the difficulty is the distrust felt toward local governments, with rumors swirling that government officials are stealing relief supplies donated from the outside (perhaps to use later to give out during election campaigns). Nancy Young is an independent writer and editor who works with nonprofit groups who work in and for Haiti, primarily in the Cite Soleil section of Port-au-Prince and the Institute for Justice & Democracy in Haiti. Previously she was an editor and reporter at The Virginian-Pilot in Norfolk, VA.
A Rockefeller Foundation study lays out a long-term agenda for Los Angeles to build a more resilient city, with a five-fold focus on economic security, climate adaptation, leadership and engagement, infrastructure modernization, and disaster preparedness and recovery.